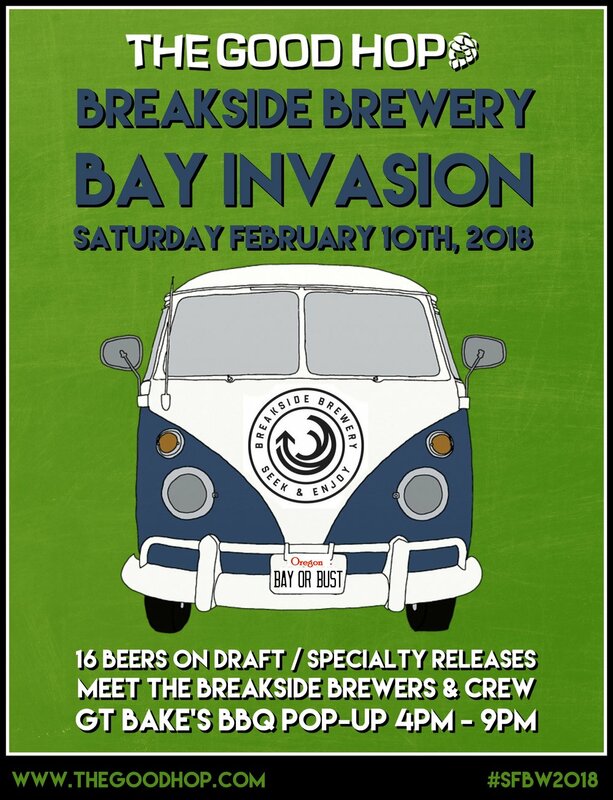 Breakside Brewery is officially invading the East Bay for SF Beer Week 2018! Their core beers are set to release Bay-wide in mid January, but we are upping the ante and laying down the welcome mat in grand style. Saturday, February 10th we are hosting a FULL, 16-TAP BREAKSIDE TAKEOVER at The Good Hop. The Breakside owners, brewers and crew will be makin' their way down the coast for this one, and will be hanging out throughout the evening. Of course we'll have some specialty releases, rare, never-before-seen-in-Cali draft options, and some bottles for you to take home. GT Bake's BBQ will be in the house from 4pm - 9pm, so come hungry and ready to feast on some killer BBQ ribs, brisket and beer.